Hard water is the second most common condition found in water supplies throughout the US effecting more than 85% of the country fresh water resources. 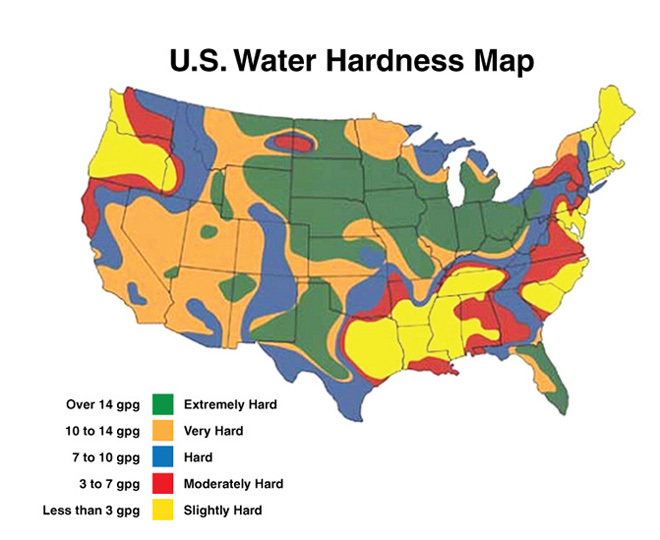 Hard water is classified by the EPA as containing hardness minerals that are at least 3 grains per gallon when tested. While these are certainly unpleasant and or inconvenient effects, hard water is not a hazard to human health and can be treated easily with H2o Easy products. If you suspect that you have hard water, we can perform a simple and quick test to determine the severity of hardness and then prescribe a solution. If you are connected to a public or municipally treated water supply system, Hardness levels are monitored regularly by the purveyor and they will provide the information upon request. If you are on a private supply such as a well or spring, simply collect a sample in an approved container and take it to our testing facility. You may also request a free comprehensive water analysis here, and we’ll be happy to perform the procedure for you. Water is considered hard when it exceeds 3 grains per gallon (gpg). 1 gpg is equivalent to 17.1 parts per million, so if your water is 171 ppm, then your hardness is 10 gpg. Hardness levels in western North Carolina vary considerably base on location and water source. Some areas are as high a 30gpg while other areas have only trace amounts of hardness minerals. If your water is found to be hard, there are a few options available to aid in managing this condition. The most common way to soften water is through an ion exchange water softener. This system works by exchanging positively charged hardness minerals (calcium and magnesium) with positively charged softening minerals such as sodium or potassium, on a resin surface that is regenerated. This exchange of minerals softens the water and can extend the life of plumbing systems by reducing buildup in pipes, plumbing fixture and appliances. Residues, including soap scum and spotty dishes, should also diminish. There are two basic considerations for ion transfer softeners. The first is an automatic softener. This type of softener is connected to a 24 hour clock timer which at a predetermined time intervals begins the regeneration process by flushing out the hard ions which have attached to the resin and replacing them with the soft ions. This then allows for a continuous exchange of hard and soft ions throughout the day. The second type of softener is the demand initiated regeneration (DIR). With this system, regeneration occurs only when soft water has run out. Since this system adjusts to the amount of water used as opposed to the automatic type, it uses less salt and water and is more efficient. The H2o Easy Hard Water Genie utilizes proprietary media that not only remove hardness mineral from your water but will eliminate pre-existing build up from within pipes and fixtures.